Boudicca was the Queen of the Iceni tribe, so legend says. She was a strong and active woman who wouldn’t take no for an answer. Boudicca sounds like my kind of BFF. I have been very vocal in the last few weeks about my hate of the winter months and my yearly struggle with Seasonal Affect Disorder.I am 99% sure I was a Hedgehog in my previous life as at the first signs of a winter chill I want to stuff my face with food and hibernate until Spring. I realise this is not a healthy attitude to take especially with 2 little munchkins to look after. Every so often we all need to give ourselves a kick up the bum, stop moping about and take some action. The best prescription for the ‘winter blues’ is exercise and lots of it. I hold my hands up and admit that the only run my legs have been on lately is the school run so to help lose the Prosecco pounds I gained over the summer I have signed back up to the local YMCA gym. Now the noisy pumping classes at the gym may help me lose weight but they aren’t very relaxing. So to bring a little bit of Zen back into my life I started doing Yoga & Pilates at home.It can be hard to fit exercise into a busy schedule especially when you have the kids off from school.So the easiest solution I have found is to get them to join in. While Charley had her morning nap today Harry joined me in a spot of meditation & stretching. 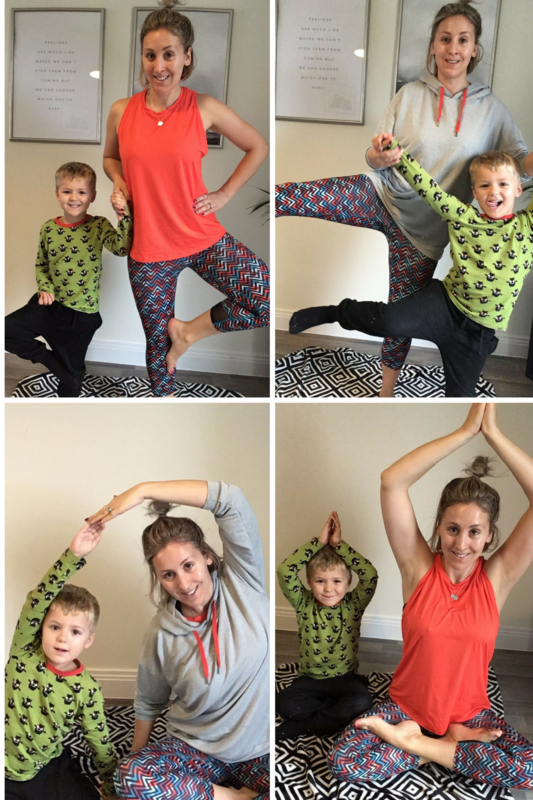 Harry has already been introduced to Yoga at school so he jumped at the chance to show off his skills ( & be in a few photos). When you undertake a new exercise regime you must always do 2 things, make sure you take advise from a health professional and make sure you are wearing the right clothes. I have always been one to pick colourful clothes over plain and boring ones and my workout wear is no different. Today’s ensemble was kindly sent to me by Boudavida. Founded by Anabel Sexton ex-competitive sportswomen & her daughter Gabriella they are huge champions of women in sports. For every item purchased Boudavida donate 5% to grassroots programmes for women & girls across the UK. Here’s an interesting fact for you. Did you know that only 7% of media sports coverage is dedicated to women and even worse only 0.4% of commercial money invested into sports reaches females athletes?Without the media coverage, sponsorship or investment into female sports, many talented athletes fail to live their dreams and leave their chosen sport without the opportunity to represent their country or be role models for the next generation of females.So Boudavida wants to bridge the gap and make as many dreams as possible come true. Pow-Pow Tank Top – Orange – I ordered this in a 12 and it’s lovely and oversized. The fabric is really soft and doesn’t restrict your movements like some tops. The fabric is breathable and draws away any sweat easily. 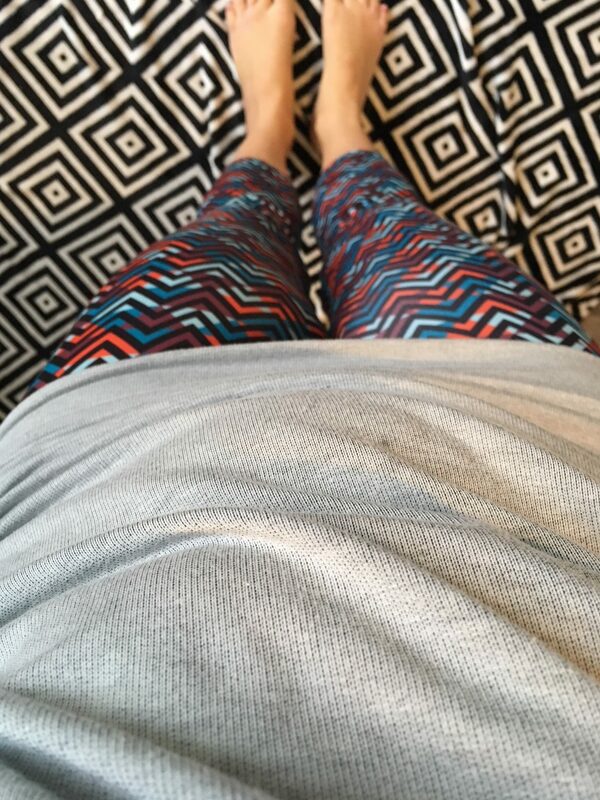 Zoom Leggings – Zig Zag Print – Once again I ordered them in a size 12 and a nice comfy fit. They have a high waistband to help draw in that ‘Mummy Tummy’. These are perfect for low impact activities but I also wore them to high impact classes at the gym and they to helped keep me cool. Cwtch Hoodie – Cloud Grey – Cwtch is the Welsh word for ‘cuddle’ and this hoody definitely lives up to its name. Super soft and lightweight it’s perfect for the end of a Yoga session or wearing to and from the gym. If you are an aspiring athlete, or are involved in a grassroots programme for women or girls, and want to be one of the recipients of the 5% donation, then send an email to contact@boudavida.com and tell them exactly why Boudavida should consider you. I hope you all have a Happy, Healthy & Harmonious Weekend.